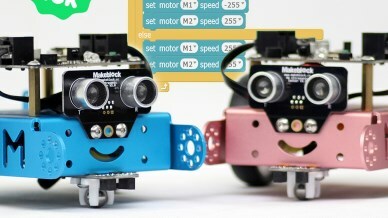 MBOTS with Scratch 1 is an object follower Robot that uses two main functions, Me Line follower & Me Ultrasonic Sensor. Scratch is a powerful program that introduces students to coding. In this class they will apply what they have learned in Scratch 1 to control a MBOT Robot. Students will use their imagination to manipulate and perform a variety of tasks and movements. Come join this new and exciting class with us!